WINNER OF THE 2013 THREE CASTLES DESIGN AWARD! 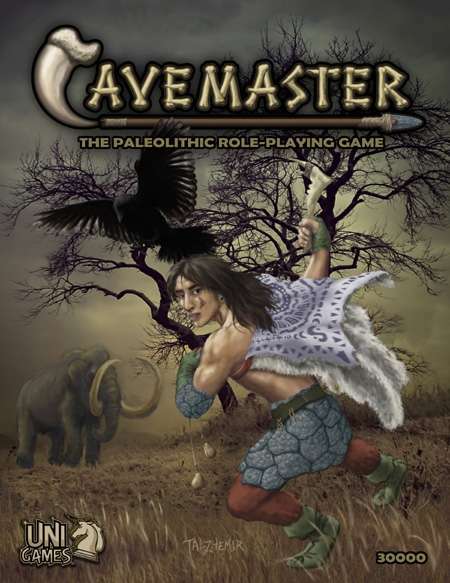 Cavemaster is the amazing tabletop role-playing game of stone-age adventure. The core rulebook gives information on the authentic creatures that lived 10,000 years ago, such as Saber Tooths, Short-faced Bears, and Mammoths. There's an optional "Spirit Magic" system if you want a bit of fantasy flavor. It's played using small handfuls of pebbles instead of dice. Because it's possible to do damage back when attacked, fights go quickly. The mechanics are simple enough to have been passed down verbally from each tribe’s Cavemaster (CM) to her (or his) apprentice(s). Incidentally, it's also a great introductory RPG system for kids! Available for this game: Please check out "Dinosaurs of the Lost Valley", an expansion that adds 24 categories of dinosaur and two playable saurian races! Also available: From time to time we publish a fun "Pay What You Want" paper mini (free or leave a tip if you like). For example, you can download Columbian Mammoths and Beedoweks (Ceratosaurids).